I saw the shiny orbs of deep garnet bulging from the plastic bag they were packed in and knew I had to have them. The sale price posted above all but screamed my name so I chose a bag and gingerly placed it in my cart after turning it over to inspect its nether regions. I didn’t care how great the price was — there’s nothing worse than a rotten cherry, except perhaps a rotten grape. I had no recipe in mind, which makes no difference when I can flip through seasonal magazines or Google Cherry Ice Cream regardless of what Julia Child may have thought about the dedication of cooks who do this to make decisions about what they’ll prepare when they haven’t planned. I’d like to say it’s more about seizing an opportunity which is what we have to do with seasonal products and if that makes me less than a serious cook to some, so be it. My inevitable Google search led me to a site I’ve enjoyed since first beginning my own more than two years ago: 101 Cookbooks. 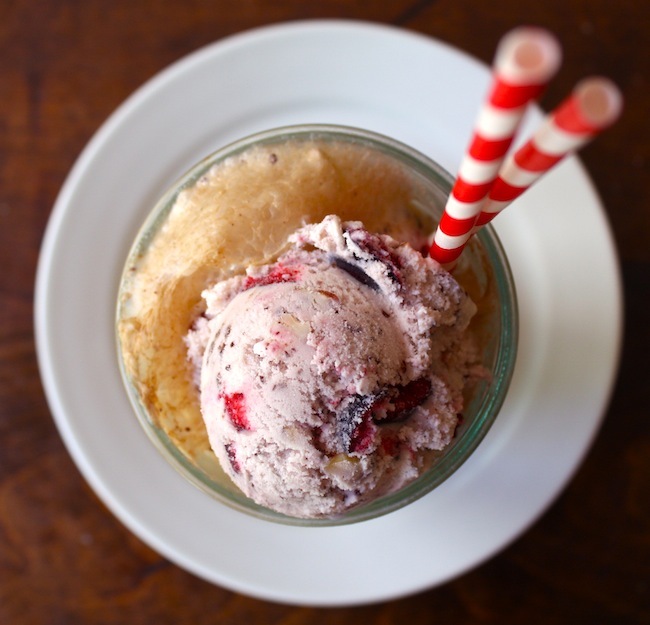 And although the recipe I chose there didn’t include the Coke float I ended up making with my ice cream, it was certainly an excellent place to begin. To prepare the egg yolk, place a whole egg shell and all in a sauce pan of water and heat over medium just until it begins to boil. Cook for 2 minutes, remove from water, and crack the egg open, releasing the yolk into a medium bowl. The whites will be fairly firm and will not leave the shell. To the egg yolk, add the heavy cream, half-n-half, almond extract and sugar, stirring until sugar is dissolved. 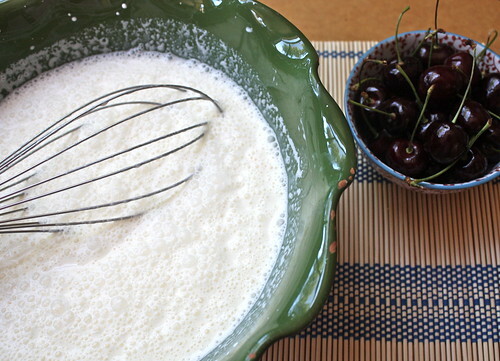 Add the halved cherries and mix. Cover the bowl and chill the mixture either in a prepared ice bath or the freezer at least 30 minutes, stirring occasionally. 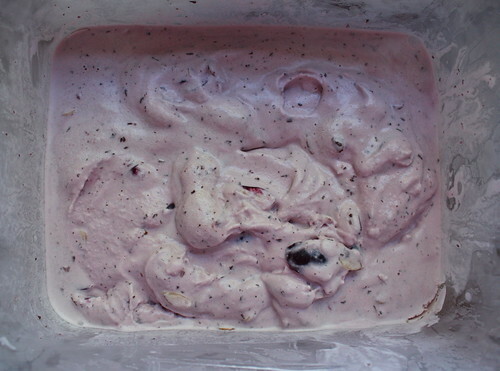 Pour mixture into the prepared ice cream freezer and process until the ice cream reaches a semi-firm consistency. Add the almonds and chocolate and allow to process until incorporated. Spread in a freezer container at least 1-2 hours, stirring once or twice during that time. Allow to sit at room temperature about five minutes before scooping. 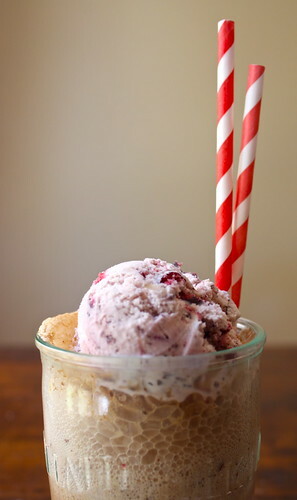 To make a Coke float, add two scoops of firm ice cream to a glass and slowly pour over the Coke. Add a couple of straws, find a good book and some sunshine and relax to enjoy. The original recipe calls for raw egg yolk. I’m one to make sure raw egg is cooked to a temperature that will provide some degree of safety, so have included those directions above. I use the same method when making a caesar salad dressing. You just never know. This recipe — even cut in half as I did — makes too much for my Cuisinart Ice Cream freezer. I know this, and yet I persist in trying to fit it all in. You will remark that this is a pathetic practice when you find that I have three 1-qt. containers, and all I have to do is divide the mix and spend a bit more time processing a second container of ice cream to prevent the expected mess. I’m sure I just want to lick the bowl and so ignore my better judgment. 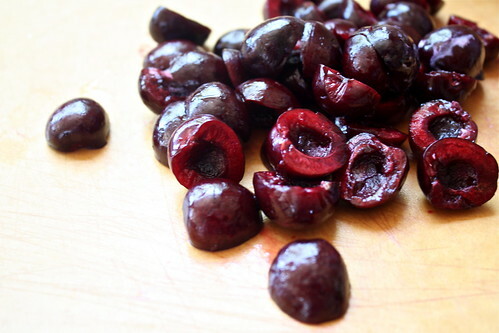 I don’t have a cherry pitter and find that as long as you have a sharp paring knife, it takes little time to prepare cherries for this. Score around the natural line in the cherry, pull apart the halves and remove the seed. You’ll have pink fingers, but if you rub some lemon on them, it will go away. The chocolate is barely noticed in this, but does add a pleasant surprise. I almost didn’t add it, but am glad I did. The Coke float is fun, but not very sweet, and it bears little resemblance to any of the floats I remember as a kid. But it’s not bad. Not bad at all. The ice cream by itself is divine.